Lakers rookie guard D'Angelo Russell was selected with the second pick in last June's NBA Draft, after tallying 19.3 points, 5.7 rebounds and 5.0 assists, during his one season at Ohio St. Thus far in his rookie campaign, the Louisville native is posting 12.3 points and dishing out 3.4 assists a game for the struggling Lakers. For the third year in row, the legendary franchise is enduring a miserable season, currently owning a 9-37 record. 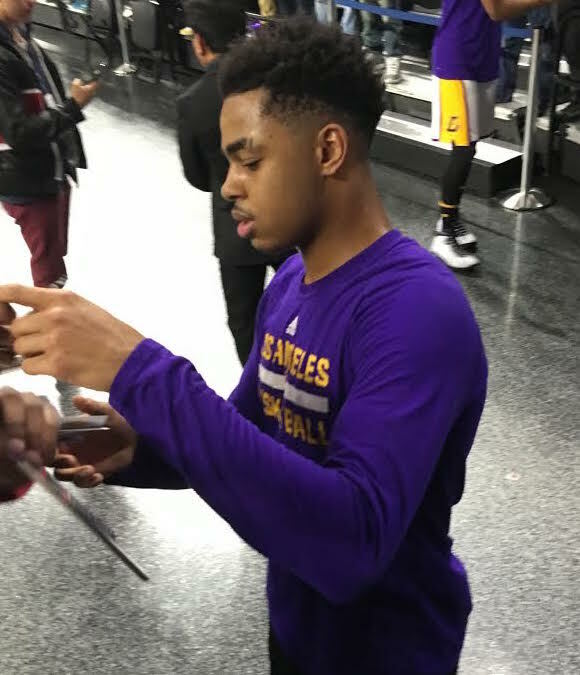 During a recent Lakers trip to Detroit, iFolloSports.com Michigan based correspondent Lance Martinez captured this original photo of Russell signing autographs. This scene took place prior to a game against the Pistons at the Palace of Auburn Hills.